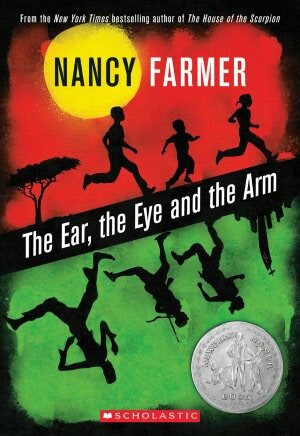 In this fiction story by Nancy Farmer, General Matsika’s children run away from their well guarded and watched over house, in the year 2194 in Zimbabwe. The parents, very frightened because they have never allowed their children far from their house, call upon Africa’s most unusual detectives,(the Ear, the Eye, and the arm), who have special powers that allow them to do things regular mortals cannot do. The children, alone out in the country of Zimbabwe must rely on only those who they can trust, to make their way safely home while avoiding evils of the past, and technology now thriving in Africa that could be dangerous to their survival. Will the children ever make it back together safely? Whose lives will be lost, if any, in this massive manhunt in search of the children? How will it end? This book was very intriguing and kept me hooked from the first chapter, and made me want to continue reading till the end. I’ve enjoyed everyone of Nancy Farmers books that she has published because she has a way of grabbing the readers attention and then throwing them of track with something very unpredictable. Even though she writes mostly fiction novels, the reader is still able to understand the concept of the book even if in only a small sense.